The Escape Short is made of 52% Merino wool and 48% Organic cotton, to create a sturdy yet lightweight, breathable fabric that feels and functions great for any outdoor adventure. From hiking or canoeing to adventurous travel, your style won't be jeapordized. Merino's anti-odor properties ensure they won't stink when you wear them for days on end. So, go ahead, lighten that suitcase and just bring the Escape Shorts. Escape Shorts, 9.5" Inseam - Mens is rated 4.6 out of 5 by 22. Rated 4 out of 5 by Pinkrobe from Great Casual Shorts My favourite all-cotton shorts finally gave up the ghost, so I decided to try the Escape Shorts. I'm used to 100% polyester or all-cotton shorts, so these felt a bit different. They are indeed a lightweight short, but in the best way possible. The wool/cotton blend feels sturdy, but not stiff, and they hang/drape rather well. The breathability has been outstanding, given our 30C temperatures lately. The cut is roomy, which is nice given that there isn't much in the way of stretch with the fabric. Still, I never feel constricted. The styling is casual, so you may want to wear something else if the queen is coming over for tea. TL;DR - Light, roomy, breathable. Would buy again. 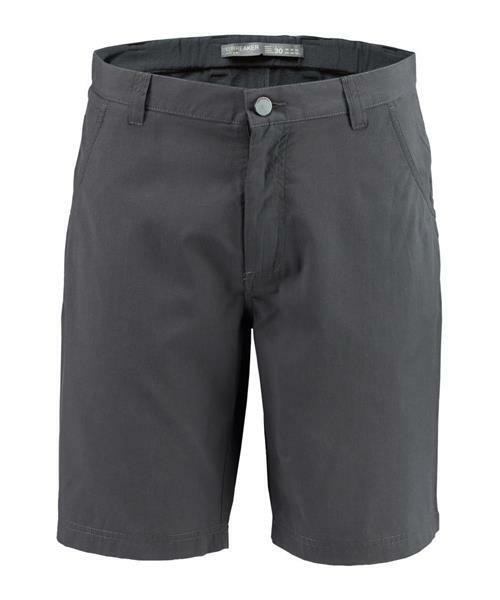 Rated 5 out of 5 by MarkB from Love the Gray Most comfortable shorts ever. Super light, soft, perfect for hiking /camping. Fit well. I ordered green (Kona) by accident, thought they would be brown, and they ran out before I could exchange for gray online. Refund was pretty swift and I found the gray ones in store. Love the shorts. Girlfriend does too. Side pockets are not deep - if you are the kind of person who carries change around. Rated 5 out of 5 by Crazykicker from Functional and stylish I really enjoyed the way these shorts fit and look. I've used them for hikes walking and cycling 100 kilometers in one day with my son behind me in a chariot. Like most Icebreaker the price can be steep, but always turn out to be the gems in my closet. Rated 4 out of 5 by zeppelinrules613 from Great lightweight shorts Love these shorts. They are so much lighter than my other 2 pairs of icebreaker shorts. My only complaint is that 1 or both of the back pockets could use a button, snap, or Velcro. If there was 1 or 2 cargo pockets I wouldn't mind. Rated 4 out of 5 by Pattington22 from Good shorts Good, comfortable shorts. They are true to size at the waist but run a little short in the length though. Rated 4 out of 5 by sugaray from Escape Shorts are the perfect escape! Love my new escape shorts. Timeless look and very functional. Would appreciate a better colour offering as opposed to the grey and green available. Great shorts for everyday wear and camping. Rated 5 out of 5 by Cami from Amazing shorts Best shorts ever! Can be worn for hicking or to go out. Very light. Perfect for our warm humid summers in Ottawa.